The extraordinary experience of the first episode “Biriki and the Rainbow” is the first step in an innovative journey of collecting stories that will guide the development of the animated series. The animaBIRIKI stories are grouped into different contexts through workshops aimed mainly at children and young people, led by the two authors. These activities are inspired by the desire for a participative and direct spreading and sharing of the project. During the activities, the people stimulated by individual and/or group artistic work, tell stories featuring already existing characters or by creating new ones. The Centre Pompidou in Paris will play host to animaBIRIKI for a special event -“mini-party”- over the weekend of 1st-2nd November. In the Forum at the entrance to the Museum and in two dedicated rooms, children will have a chance to immerse themselves in the natural and harmonious world of animaBIRIKI through workshops, projections and the world premiere of the “Nubolaria” installation. “Nubolaria”, the modern optical ‘pre-cinema’ machine for animaBIRIKI will allow children to discover the tricks of animation, playing with the two main characters against the background of the cartoon. In parallel with the projection of episode one, “Biriki and the Rainbow”, the children can create characters and stories for the television series project. The Education Office of Amnesty International Italia will be accompanying animaBIRIKI to remote, outlying areas in a project that will involve schools and communities. The first leg will take place at a school in the Ponticelli suburb of Naples, a place with a rich history, today abandoned to environmental and social decay. Subsequently, animaBIRIKI alongside Amnesty International will reach Sicily and Lampedusa. Following the weekend at the Centre Pompidou, animaBIRIKI flies to the Castellinaria festival for children and young people in Bellinzona (Switzerland). 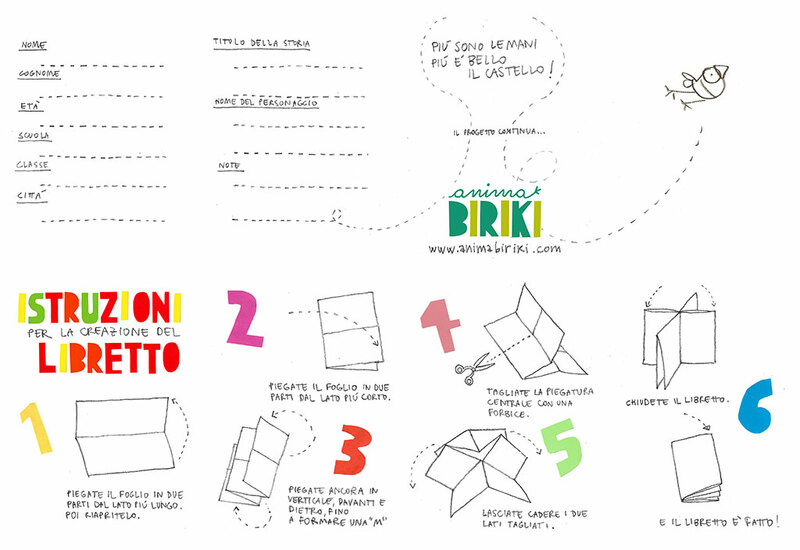 The projection of the short film “Biriki and the Rainbow” will be accompanied by a series of workshops for children designed and led by the two authors, Bruna Ferrazzini and Ilaria Turba, which will be held in Castelgrande and at the Museum in Erba. Nubolaria will be installed in a dedicated space as part of the exhibition “The Origins of Cinema” in the splendid setting of Castelgrande, open from 15th to 30th November.